The RBSP-carrying Atlas 5 on its launch pad August 24. The launch has now been delayed to August 30 (Credits: United Launch Alliance/Pat Corkery). NASA’s Radiation Belt Storm Probes (RBSP) were all set for launch on August 23…then 24th, then 25th. Now bad weather has pushed the launch back to an earliest liftoff date of August 30. 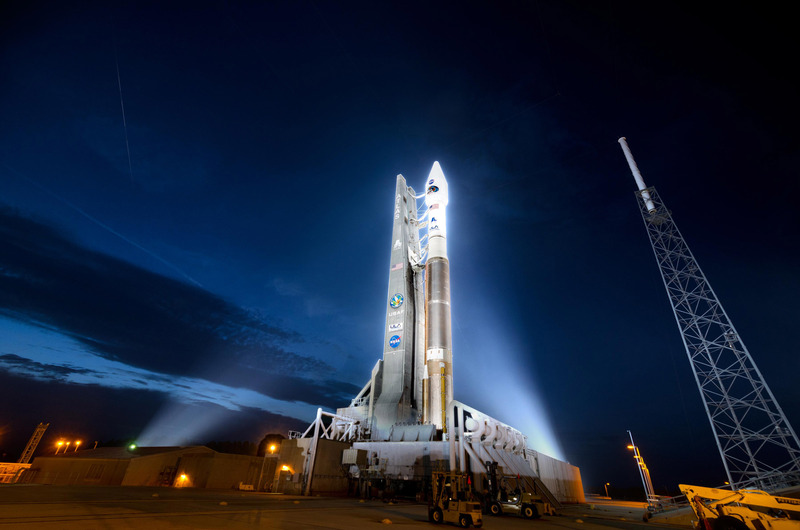 The latest delay is due to thunderstorms in the region of the Cape Canaveral launch facility. Although NASA had earlier reported that the approaching tropical storm Isaac was unlikely to impact a Saturday or Sunday launch, mission managers started getting nervous about the weather after Saturday’s launch was scrubbed. To be safe, the Atlas V launcher carrying RBSP has been rolled off the launch pad and will wait for the storm to pass by. Launch is now provisionally scheduled for Thursday, August 30 at 4:05 AM EDT. The series of delays started off with discovery of a booster problem with the hydraulic system actuators on the RD-180 engine. Although the issue was found on a different unit, the actuator is critical to main engine steering, so engineers wanted to examine RBSP’s booster as a precaution. No anomolies were discovered on the launcher. Ready for launch once again on the morning of August 24, a glitch manifested during final countdown relating to the Atlas 5 tracking beacon. “That’s a mandatory safety item so that we could track the vehicle in flight,” said launch director Tim Dunn. “It certainly was a situation we wish we didn’t have, but we wanted to err on the side of conservatism.” The problem related to a frequency drift in the beacon’s C-band transponder. The drift was deemed “out of family” not actually out of specification, and the rocket was quickly cleared for launch the following day. Alas, a Saturday launch was not to be. Despite holding an extended countdown, hoping for the weather to clear, clouds and lightning continued throughout the twenty minute launch window. Although the launch was briefly rescheduled for Sunday, August 26, mission managers quickly decided to take the safer route of waiting for Isaac to pass by, hopefully taking the havoc-wreaking weather with it. RBSP is part of NASA’s Living With a Star program and is designed to fly two probes in a high elliptical orbit for two years. As the probes pass through the radiation belts, they will allow scientists to study the belts over space and time. Radiation becomes trapped in the van Allen belts when energetic solar particles are captured by Earth’s magnetosphere. Travel through the belts can be hazardous to spacecraft since the increased radiation exposure can damage electronics.